God doesn’t want us to worry, because He wants us to rely on Him. In Matthew 6, we’re given reasons for why we should worry about food, drink, and clothes; in a nutshell, “God’s got this.” There are a lot of people around the world who are genuinely concerned about food, drink, and clothes; most of us don’t fit into that category. We have plenty. But we still worry about something: family, health, job security, retirement, bills, transportation, and so on. So, today is a fill-in-the-blank lesson on worry. Perhaps the lesson is more about releasing worry and trusting God to take care of us in His way and timing. I’m including the basic structure of the end of Matthew 6. Think about what you would put in the blanks. Having a tough day, week, month…or life? Crank up the volume and claim the hope you have even in the darkness! We browsed a photography studio. The owner and photographer chatted with us. When we asked him to choose any one of his photos and share the story behind it, he cocked his head, thought for a moment, then pointed to a photo of what looked like a church. It was a beautiful building and gorgeous photo. He shared the story of how he had been taking photos of a moose, when it started to rain. He decided to move on to another subject, choosing the church. He took several beautiful, serene photos then returned home. That night, the steady rains got heavier, and the next day, water flooded down the mountainside right beside the church. He showed us another photo, taken a few days after the flood when he could return to the area. Full grown tree trunks were stacked like matchsticks beside the church, where a deep gulley had been cut through the earth. The two photos looked drastically different. The only thing in common seemed to be the church. It was a great story. And a gorgeous photo…which we couldn’t afford. But we were grateful to hear the story and temporarily appreciate the photo. The next day, we went for a drive. As we ascended higher into the mountains, obscured by clouds, snow began to gently fall. We were about a half an hour into our drive when we rounded a curve and gasped at St. Malo’s chapel ahead of us: the same church in the photo! We pulled over and I took several photos as the snow fell. What a treat to see, in reality, what we had seen on canvas the day before. What a treat to see the healing of the trees and other vegetation compared to the damage that had been done. We couldn’t afford the original photo, but we got several of our own. We listened to the photographer’s story, then experienced our own. The story became richer with our own memories. There is a story behind every photo—whether it’s a canvas or a virtual snapshot of our life experiences—and each story is personal. We will not live someone else’s story, but God connects our stories in surprising ways. Pay attention to the snapshots He’s providing today. They add beauty to your story. At least, I thought I wasn’t. Sure, I had outlined my topics and had basic notes on paper, but I was unsettled about something. I assumed it was because I hadn’t spent enough time in preparation. It was my own responsibility and fault, and I was paying the consequences in my doubt that I would be able to minister to the fullest extent to which God intended. But why would I doubt Him? Sure, there are consequences to not stewarding responsibilities well. But ministering to a group of women for the weekend was too important to God for me and my lack of efforts to get in His way. The women were prepared. They came with open hearts and minds, ready to experience God’s presence in life-changing and life-challenging ways. Well, at least, that’s what I assume because that’s what it seemed to me. Then I realized they might have come as unprepared as I did. Perhaps their schedules were so tight that they really didn’t give much thought to the weekend until they were on their way, away from their families and jobs and other everyday constants. Perhaps they had just gone through a fiery trial or were still in the middle of it. Perhaps an abundance of blessings caused them to let down their guard a bit, taking on an air of personal accomplishment or status instead of the humble reminder that it is God who accomplishes and provides. The truth is I no more knew what each woman brought to the weekend retreat than anyone knew what I brought. Only He knew my lack of preparation, questions about His provision, doubts about my adequacy, and the needs that I couldn’t even identify. And He met each and every one. He opened my eyes to needs and opportunities I couldn’t have anticipated had I tried. He opened my heart to pour into others and let them pour into me. He opened my ears to hear from Him in a gentle whisper and an overwhelming rush of power. He provided despite my lack of preparation. He prepared me through my lack of preparation. I was caught off guard, and perhaps that’s why He moved in such powerful ways that weekend. He gives me responsibilities, but I am certainly not in control. God allowed the flood waters to cover the earth. If you’ve ever been on open water or even looked beyond the shoreline across what seems to be the endless sea, you might be able to imagine what Noah and his family was experiencing. They saw nothing but water. They were on a floating zoo that they built themselves on faith. They trusted God to provide, but their trust and faith had to be a moment-after-moment decision. They could have easily become frustrated, scared and anxious. They continued to live the lives God had directed them to live. They continued to float. 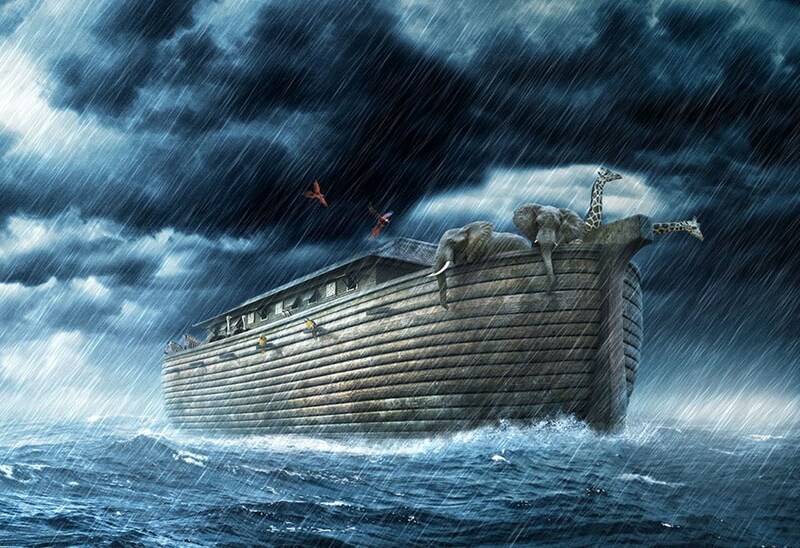 The ark eventually rested on the top of a mountain as the waters began to recede. Noah and his family moved from a constant motion of swaying to an anchor of solid ground. The waters continued to recede, and they eventually saw dry land. They could leave the ark. What next? Consider a season of your life when you felt a constant swaying. You were overwhelmed and felt your stomach churning with each passing moment. You didn’t know when or if the motion would cease. You felt as if you were on an amusement park ride that just wouldn’t stop. Perhaps when you finally stopped, the first few steps were so unsteady, you weren’t certain you had actually stopped. You could still feel the motion. You still felt queasy. What have your experiences been through seasons of uncertainty? How do you respond to uncertainty? Where do you run? God’s timing is perfect, but because we don’t have his perspective, we don’t see the perfection in all situations. We define perfection by our own standards. When we’re uncomfortable, we’re likely to say something is far from perfect. We want everything to fit together. We want to understand. We want to be able to explain and accept all things. That’s not the way of faith. When we trust God, we accept that we won’t always understand. We leave that to God. How difficult or easy is that process to you? Live It. Find a puzzle piece and place it in an obvious location so you’ll see it throughout the day. Attach it to your cell phone case, wallet, bathroom mirror, or computer screen. Each time you see it remind yourself that God knows all things. He understands how your life is growing in a process to glorify him even when you can’t fit the pieces together.